I was at a wake the other evening for a good friend’s dear grandmother, Louise. It was sad really. In a way this woman had been a part of an extended circle of mine by way of my friend. I’d seen this woman at family functions, birthdays, events during the better part of the last 20 odd years. It was sad to see my friend’s dad so shaken by grief from the loss of his elderly mom, sad to see my friend holding it together because I know that it’s got to be difficult to see and go through grief in your immediate family and sad because…well…by looking at the many photos that friends and family brought to memorialize Lou with the progression of life seems so linear. Photos are all that her children, grandchildren, great grandchildren and friends have to really remember her by. I often think about how my children will remember me someday. How I will remember their youth. I know that for many of us as we take our children to professional photographers to capture their likeness we think about how we are trying to hold onto the here & now. How we cling to the stages of a child’s life because they are ours and we know that time moves quickly. Quite frankly I myself didn’t realize how quickly the passage of time cruises until my children hit school age and all those early milestones have become a dim memory. Incidentally enough, last year we took a trip to Grand Rapids, Michigan to have our family photographed. I wanted to memorialize that time in our lives, planned for over a year for it. I gave myself a year: planned on losing 15 pounds, planned on looking all glamazoned up. It didn’t happen. As the day came upon us, all the lost time for losing that last 12 pounds (hey! at least I lost 3!) melted away and the realization that I do not have family photos of all of us and yes, I still hung on to much of the weight I wanted to lose, but time moves, quickly and it hit me: the realization that life is all too short to NOT do this. Those images are not the very best photos of me. I know this. But I know that at the time of my death when friends and family are (hopefully) gathered around me remembering my life those photos will be there to remind everyone, my children especially, that I thought enough of our family to memorialize the present. As an aside, it is remarkable to me that all the photos progressing through Lou’s life, she looked most happy and joyous as a grandmother. 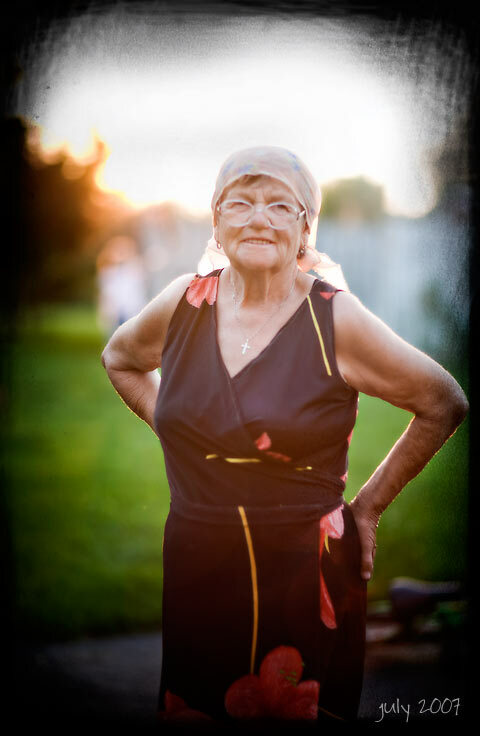 The smile on her face in those images with her grandchildren…those were amazing to me. There was pure joy. I think that therein lies a secret somewhere. Perhaps we will never hold on to our youth and vitality but we will always have the photos there to remind us of who we once were and how happy we were. p.s. Happy 79th birthday to my very lovely mom! Today is her big day. I know she doesn’t use the internet (or understand English very well entirely) but happy day to her! Happy belated birthday to your mother!